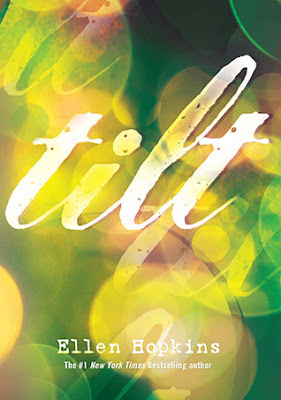 Love—good and bad—forces three teens’ worlds to tilt in a riveting standalone novel from #1 New York Times bestselling author Ellen Hopkins.Three teens, three stories—all interconnected through their parents’ family relationships. As the adults pull away, caught up in their own dilemmas, the worlds of the teens begin to tilt. Mikayla, almost eighteen, is over-the-top in love with Dylan, who loves her back jealously. But what happens to that love when Mikayla gets pregnant the summer before their senior year and decides to keep the baby? Shane turns sixteen that same summer and falls hard in love with his first boyfriend, Alex, who happens to be HIV positive. Shane has lived for four years with his little sister’s impending death. Can he accept Alex’s love, knowing his life, too, will be shortened? Harley is fourteen—a good girl searching for new experiences, especially love from an older boy. She never expects to hurdle toward self-destructive extremes in order to define who she is and who she wants to be. Love, in all its forms, has crucial consequences in this wrenching story from Ellen Hopkins. This book was kind of a let down for me. I’ve absolutely loved every single one of Ellen Hopkins’s books, even Identical which weirded me out. This book just didn’t do it for me like I expected it to. It was good don’t get me wrong but the verse wasn’t as poetic as it use to be. It just stated things as they were. It didn’t have a deeper meaning. It just… wasn’t to the standards I was use to. I also couldn’t connect to the characters very much. Shane started off okay and ended up annoying as hell. I could sympathize with him but overall I just wanted to smack him for being over dramatic. Harley was basically what most thirteen year old girls are now a days. Misguided and trying to grow up too fast. I couldn’t connect with her, maybe because of our age difference. Mostly her chapters made me anxious because I knew things where only going to get worse for the girl who falls for the wrong guys and doesn’t know when she’s being used. Mikayla was the only one that didn’t make me on edge her issues were something I’d sort of dealt with and weren’t written in a way that made a point to how big her situation actually was. The ending was rushed and way too open ended, there was no closer at all. It’s like Hopkins got tired of writing. No one’s stories came to any sort of a close. That’s mostly what annoyed me about this book. Everything else you can deal with, but I despise books without endings. Don’t feel bad! I haven’t read a single one either! I don’t care for books in prose. Brooke has read a bunch like this one, she loves them. Thanks for stopping by!